I’ve read a few of Alexie’s more recent works (Flight, Ten Little Indians, and The Absolutely True Diary of a Part-Time Indian), but I have to admit that this might be my favorite thus far. I think part of the reason for that is that, as a collection of related short stories, it has many messages to send. 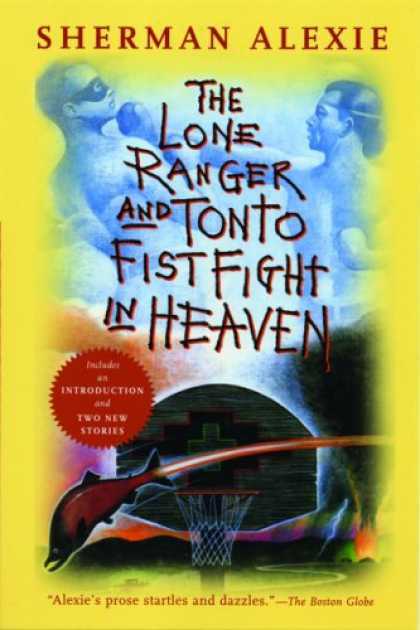 Of course, as Alexie admits in his new introduction, some of those messages can be misconstrued (he tells the reader that he received a lot of criticism for the abundance of alcoholic Indians populating the pages of this book, but that it was largely autobiographical and not something he intended as a message about alcoholism on Indian reservations). One such message that I think could be taken away from this book, mistakenly or not, is that in order for an Indian to succeed, s/he has to leave the reservation. In fact, most of the Indians who stay on the reservation are portrayed as people who are going nowhere, or who have nowhere to go. At the same time, most of the people who leave the reservation either (1) return defeated and hopeless, coming home to nurse their wounds after realizing they don’t belong “out there,” or (2) simply disappear, never to be heard from again. Several characters throughout the collection talk about how it’s a good thing when the kids leave the reservation, because at least they’re taking a chance instead of ending up young drunks. This is, obviously, problematic (and it’s something that’s present in different ways in all three of Alexie’s other works that I’ve read). That’s not to say that the stories are all bad, and the collection is rife with negative messages and stereotypical portrayals of Native American life on the reservation. Like I said before, this is my favorite Alexie work that I’ve read so far. That’s because of some of the other messages embedded in these pages, perhaps most significantly the message about community. The characters in this collection care deeply about one another. They show their feelings in a variety of ways, and when you read story after story about people who know each other, who help each other, who give what little they have to give and hold back their judgment, it starts to sink in. Perhaps this does something to counteract the previous leave-the-reservation message. Can we read this as the reason all these people eventually return to the reservation? Do they disappear when they leave because the world outside the reservation not only doesn’t care about them, but actually hates them? When I think of it that way — that the reservation is the space filled with familiar faces and kind hearts — it starts to make sense in a whole other way. Instead of returning to the reservation because they have to, because the world kicked their asses and they’ve given up, maybe they’re returning because they tasted the world and it was rotten. These characters would rather live on the reservation, with its poverty and other issues, than stay in a city that doesn’t have anything to offer them. Now that I’ve wildly contradicted myself and argued over my own words, I have one more thing to think about: the two stories at the end of the collection. I read the 2005 version of this collection, which has two new stories tacked on at the end. They definitely felt like add-ons (the different font didn’t help). Interestingly, neither one featured an alcoholic Indian (was Alexie, perhaps, trying to desaturate his collection here? ), and both focused on immediate family — one on a brother captured in war, and one on a father who plays only a small role in his son’s life. I always feel weird about authors adding to their works after many years have passed (in this case, 12 years passed between publications), and wish that more was said about these additional stories to give some context (Were they written along with the other ones, but failed to make the final cut? Were they written in the time between the two publications? Were they a reaction to the criticism Alexie received for the original collection? Were they stories he always wished he had included, but for whatever reason didn’t or couldn’t?). And since I have no answers for these questions, this post is over.